We are pleased to announce that renowned artist, Iwan Bala will be exhibiting a new body of works never before seen by the public. In these works of the past five years, Bala's interest lies not in ornamental cartography, in skillful and pleasing formations of letters but in attempting to express the spontaneity of the moment of writing, the rapid often stumbled, crossed out, corrected, blotted, re-adjusted rush to put thoughts on paper (beer mat or envelope). The attempt of a poet to capture a line before it ebbs in the memory. His desire, in a sense, is to return to the origin of the words, the point before the poem becomes a perfectly typed copy, or is reproduced in the pages of a machine made book, replicated exactly in hundreds or thousands of exact duplicates. Because the poem is only ONE, it is a unique creation, and I want to return it to that one, unique object. 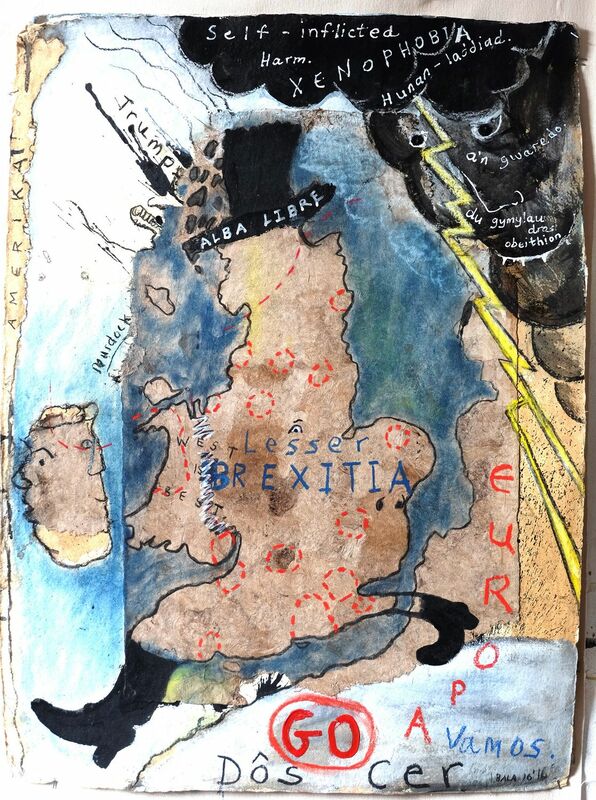 Responding to the result of the electorate's vote on the UK's EU membership, Bala began to make (alongside politicized ‘maps’), satirical caricatures of the principle players in this grand fiasco, this ‘Eton mess’. An Artist has a duty to comment, protest and become an agent provocateur through the medium of visual communication. Cartoons have a long and illustrious history, and have always lurked somewhere in the background environs of his artwork. Iwan Bala is an established artist, writer and lecturer. Bala’s multiple award winning practice has recently centred around the culture of the Welsh language in its literature, with poetry, hymns & anthems taking centre stage in his raw, immediate & text-heavy work. Bala has exhibited widely, with works in private and numerous public collections including the National Museum of Wales, Contemporary Art Society for Wales and the National Library of Wales.